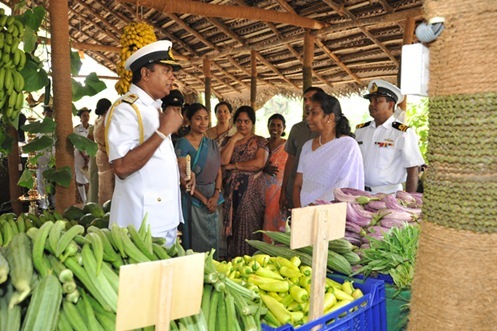 Sri Lanka Navy’s Seva Vanitha Unit has started selling vegetables to the public from March 24, 2011. The vegetable outlet is located closer to SLNS Gemunu in Welisara. Sale of fresh quality vegetables and fruits through this vegetable outlet is taken up as a welfare project to meet the requirements of navy personnel and members of the general public at reasonable rates. This is possible as the outlet makes direct purchases from the farmers and sells without involving any middleman. Here is a photograph of the vegetable outlet from the Ministry of Defence, Sri Lanka. In Sri Lanka, the Army also sells vegetables from January 07, 2011 to the public to control price rise. For more photographs and more details, log on to Ministry of Defence, Sri Lanka.